GARDINER — The third installment toward Kennebec Savings Bank’s pledge of $100,000 in support of the historic renovation of Johnson Hall was made May 1, when the bank’s President and CEO Andrew Silsby presented a check for $25,000 to Michael Miclon, executive artistic director of Johnson Hall. 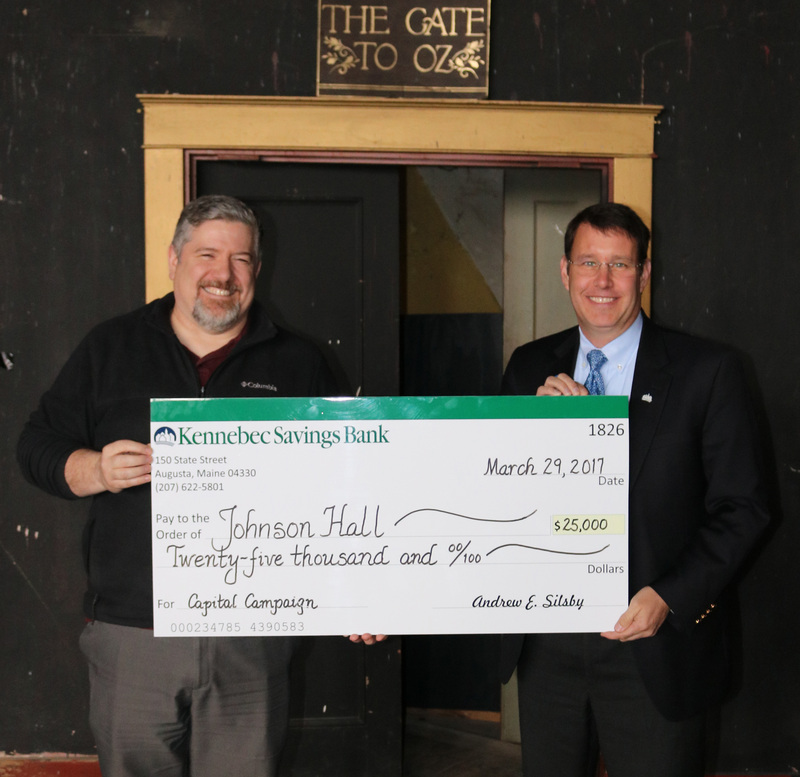 Johnson Hall, at 280 Water St., is raising $4.49 million to complete a historic rehabilitation of all three floors of the building, which houses the performing arts organization. The expansion will provide a 400-seat theater on the third floor; a lobby and concession area, restrooms and a green room/dressing room for performers on the second floor; an expanded foyer and full-service box office on the ground floor; and Americans with Disabilities Act-compliant access, including an elevator serving all three floors, the organization said in a news release. The project will also fulfill the organization’s mission to promote, create and inspire artistic excellence through the presentation of world-class entertainment and professional performing arts education and to drive cultural and economic growth for our community, which can’t be accomplished in the limited 117-seat Studio Theater on the first floor, the release said. “Together with support from Kennebec Savings Bank and our capital campaign team, this rehabilitation will not only provide a vibrant arts and entertainment component to the local regional economy, it will also be an economic driver, generating three to four hundred thousand dollars per year for the local and regional economy,” said Miclon. Spending on live entertainment has a direct multiplier effect on local and regional economies. According to analyses by Americans for the Arts, local audience members spend an average of $17 a person, while those traveling farther from home spend $40 a person on meals, transportation, retail shopping and related activities — all in addition to the price of tickets. Re-opening the former Opera House theater with expanded seating capacity will triple and then quintuple the number of patrons passing through the doors — from 3,000 a year in 2015-16 to 9,000 in year one of full operations, and more than 15,000 by year three, the release said. Kennebec Savings Bank, in addition to its $100,000 pledge toward the fundraising portion of the campaign, has committed to buying historical tax credits, construction and pledge financing, the release said. The bank has offices in Augusta, Waterville and Farmingdale.